How to Roast Pumpkin Seeds | I Wanna Bake! It’s officially time to start carving pumpkins, and with carved pumpkins comes pumpkin seeds. You could, of course, throw these away along with the skanky pumpkin guts with nary a second thought, but why waste such a tasty, versatile snack? Roasting pumpkin seeds is is super simple, and doing it yourself allows to you use whatever seasonings you want (because let’s be honest, those salted ones you get from the grocery store can get a bit gross after about two seeds). You also don’t have to limit yourself to roasting just pumpkin seeds. 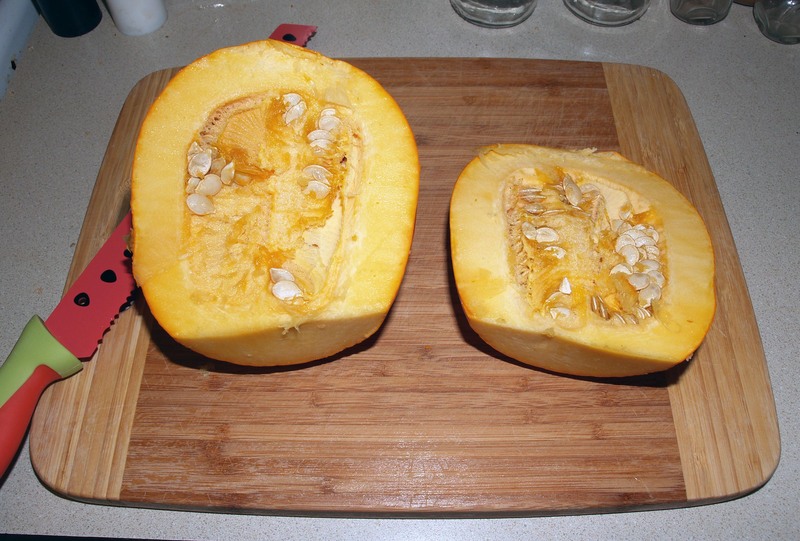 Any squash with similar seeds (eg, butternut or acorn) will work. For this tutorial, I ended up using a mix of pumpkin, butternut, and acorn squash seeds because my pie pumpkin had unusually few seeds. Normally, I find that pie pumpkins have as many if not more seeds than your garden variety carving pumpkin, but sometimes they disappoint. 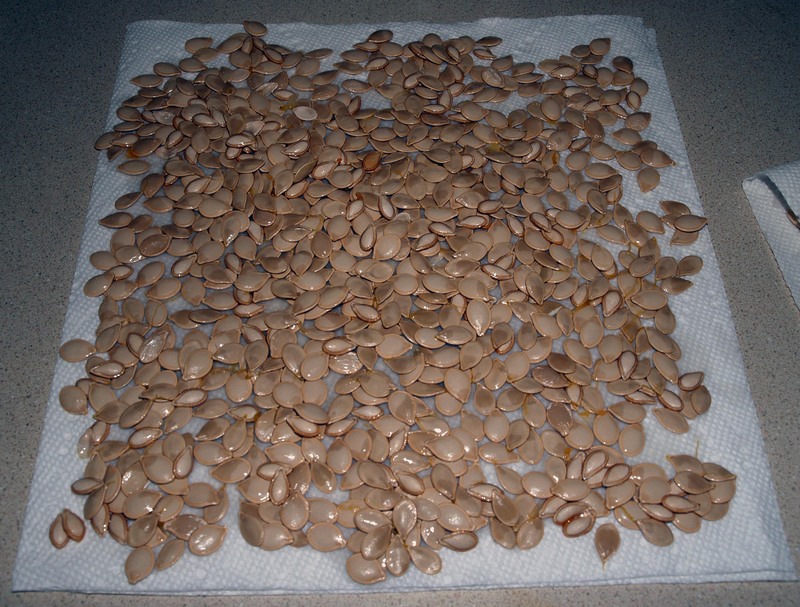 Regardless of your source of seeds, here’s an easy tutorial on preparing your them. Preheat your oven to 250°F. If you’re carving a jack-o-lantern, cut a hole around the stem as normal. If you’re using a pie pumpkin, there’s no need for that kind of care for the structure of the pumpkin, so you can just cut off the top and cut it in half (I used a watermelon knife for this, but any large, serrated knife will do). Scoop out the guts and do your best to separate the seeds out into a colander. Some strings and sludge will stick on the seeds, but that’s ok. Just try to get rid of the bigger stuff without discarding the seeds as well. When you’ve gotten all you can get out of the pumpkin, rinse the seeds with cold water, rubbing them to remove any stuck-on bits of pumpkin guts. Pick these pieces out as you go. When you are satisfied with the cleanliness of the seeds, pour them out onto paper towels to dry. I press another paper towel on top once they are in a single layer. Transfer your seeds into a measuring cup to determine how much you actually have (I had about 1 cup). 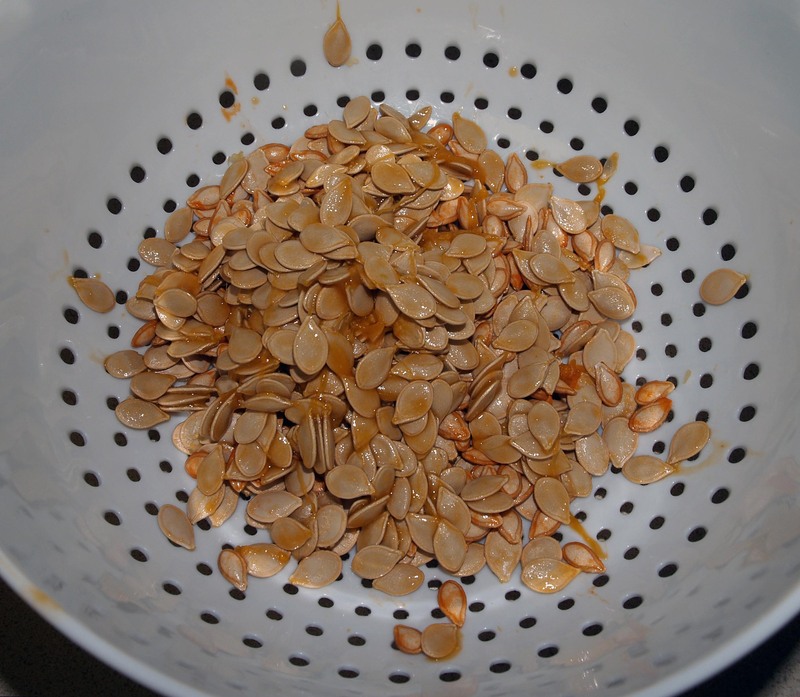 For each cup of seeds, melt 1 tablespoon of butter. Mix the butter into the seeds until they are fully coated. 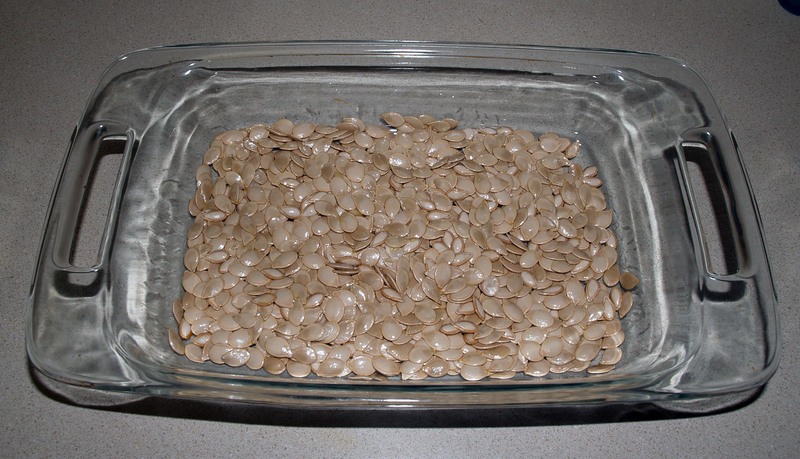 Spread the seeds in one or two cookie sheets (depending on how many you have) in as thin a layer as possible. The more they overlap, the more they will stick to each other and the longer it will take. Sprinkle the seeds with whatever seasoning mix you’d like (salt is classic, but cinnamon or pumpkin pie spice are nice, and while I’ve never tried it, I’m sure curry powder would be a hit). Stir them to make sure the butter and spices are well-mixed. Bake the seeds for 1 hour, stirring every 15 minutes. Start paying close attention to the seeds after 45 minutes, as they may be done slower or faster depending on your oven’s consistency and the size of the seeds. When they’re done, they will look mostly dry and golden brown. That’s all there is to it. 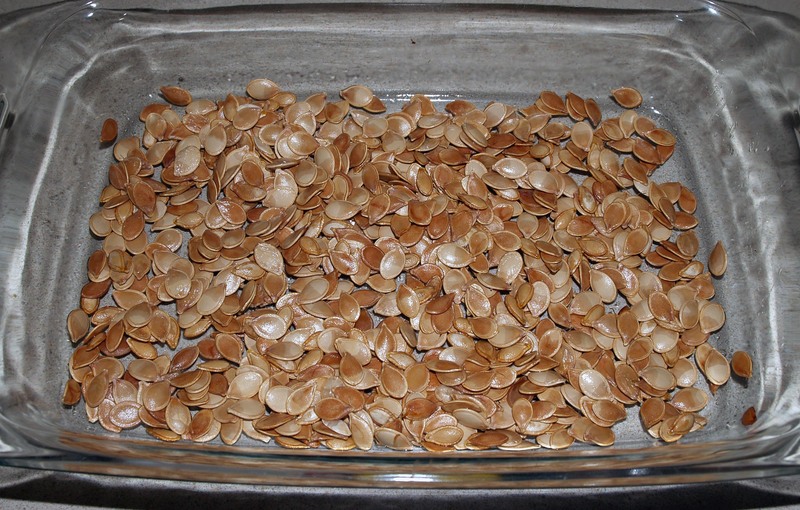 Let the seeds cool before eating, and store them in an airtight container for up to two weeks.